A Hen Harriers hunting technique and grace is a joy to behold. 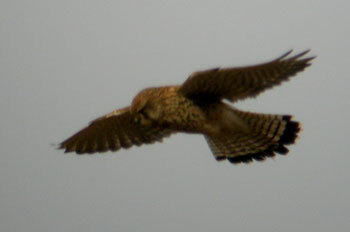 Short Eared Owls feather markings and flight are magical to watch. Found on Mull all year this iconic bird is now found almost exclusively in Scotland in the U.K. with only 1 bird in England and a re-introduction programme in Ireland. 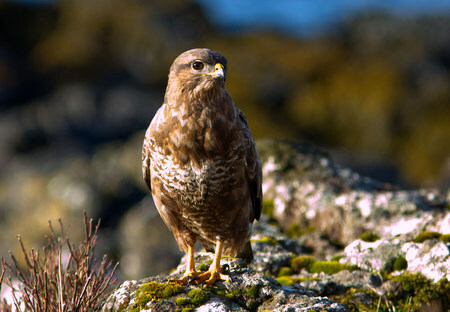 On Mull we are lucky to have several pairs as there is no persecution of birds of prey on the Island. 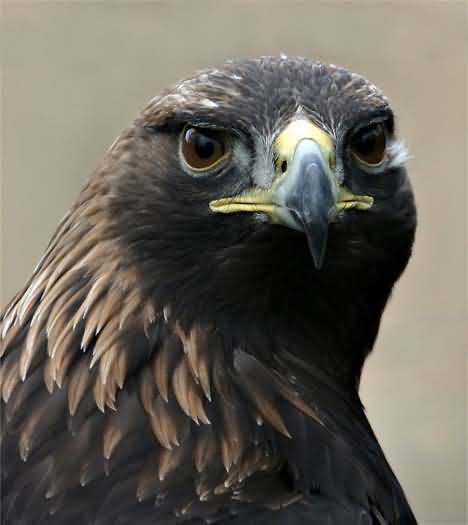 The golden Eagle has a wingspan of 204 to 220 cms or 6ft 6ins to 7ft 6 ins with a body length of 75 to 88 cms or 2 ft 6 ins to 3 ft and weighs 4 to 6 kgs or 9 to 13 lbs. Their diet consists of small birds to large mammals, mainly hares and rabbits although on the west coast they eat more carrion such as deer and sheep as prey density is much lower. Golden Eagles have been around since the last Ice Age about 12,000 years but never in great numbers due to large territory demands. Nest building takes place in January and February and sitting taking place in March or April with an egg incubation time of around 6 weeks. Two chicks are often hatched but more often than not only one survives. The young fledge at about 11 weeks of age but this can vary and they stay within their parents’ territory for anytime between a month to 5 months depending on the size and independence of the youngster. 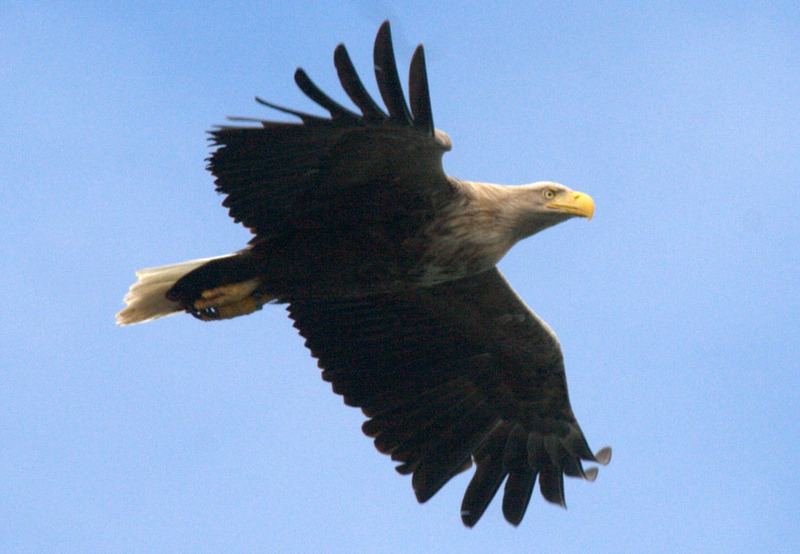 Found on Mull all year this awesome bird, the 4th largest Eagle in the world was successfully re-introduced to the west coast of Scotland in 1975 and now we have approximately 40 breeding pairs on or around the west coast. Formally know as the Ern the earliest records in Britain date from approximately 125,000 years ago. 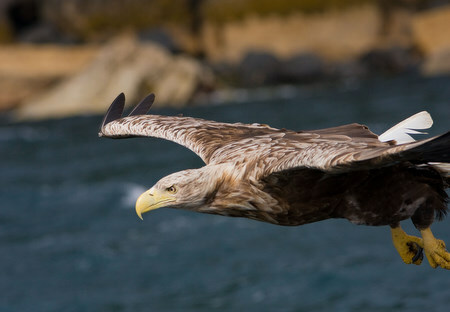 White- tailed Eagles can live for around 30 years and have an amazing wingspan of 2 to 2.5 metres (6 to 8 feet) with females being bigger than males. This large Eagle has a body length of 68 to 90 cms (27 to 36 inches) and weighs 3.1 to 6.9 kgs (7 to 15 lbs). The nest is very large 1.5 metres (4.8 feet) in diameter, usually in a tree and by the coast; 1t starts off shallow but gets deeper over time. It consists of Twigs, Heather, Seaweed and Driftwood and lined with grass. Incubation takes about 38 to 40 days and 1 to 3 eggs are laid, both birds take turns nestling the eggs with changeovers about every 4 hours. When the young have hatched they are looked after by both parents for 2 to 3 weeks with one or two hatchlings being the norm. 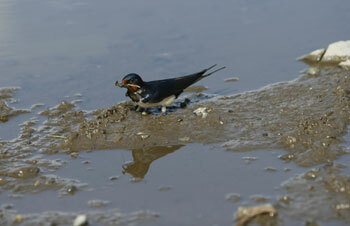 Both parents bring in food but the female mainly responsible for feeding the very young chicks. 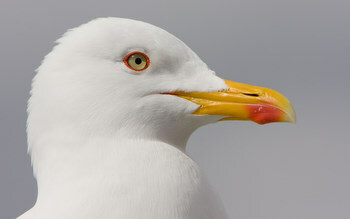 The diet is very varied can include snakes, frogs, hares, rabbits, small lambs and goats as well as the usual sea birds and fish. 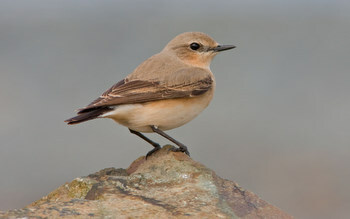 Fledging takes place between 70 to 80 days after hatching and they can stay in and around the nest site for some time. The young begin dispersing in the autumn giving their parents a brief respite before the process starts all over again as most Eagles are monogamous. The most persecuted bird in Britain as they are moorland birds that take young grouse chicks, found all year on Mull and in good numbers in good vole years. 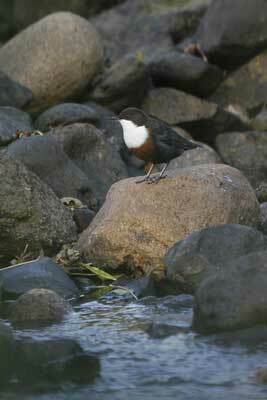 The males, much smaller than females are prominently grey in colour with a white rump and black wing tips. The females and juveniles are brown with the distinctive white rump showing well and giving the females the name ringtail, juveniles have a more Rufus underbelly. The two sexes were once thought to be separate species because of their colour difference and they got there name from their habit of eating domestic fowl. There are about 400 breeding females in Britain most of them in Scotland, their preferred habitat being young woodland, heathland and moorland. 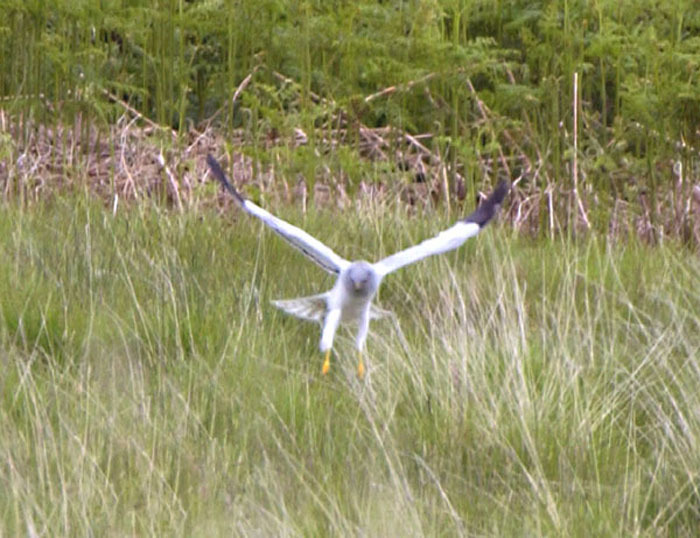 Hen Harriers are ground nesting birds laying 4 to 6 eggs at 2 to 3 day intervals with incubation lasting between 29 and 39 days resulting in different chick sizes. The female incubates the eggs and is fed by the male ‘prey passing’ and the young leave the nest at 2 weeks old and fledge at 6 weeks remaining dependant on their mother for a further4 weeks. Their diet consists of small birds and mammals mainly voles although they can take small Hares and Rabbits in some areas. 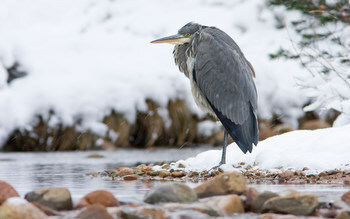 When hunting rodents their flight is very slow with few wing beats, hunting birds the flight is much faster but on the whole when hunting they prefer the element of surprise. 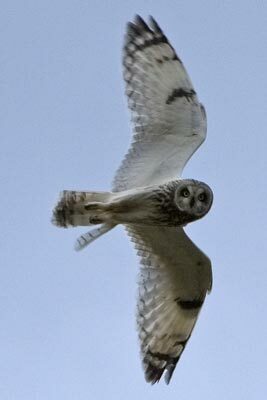 This beautiful day flying owl is a joy to see, both sexes are similar, but the male is paler and less heavily marked. Their wingbeats are slow and steep making their flight more like a butterfly or moth. The Short-eared Owl has a long wing span compared to body length, the length being 37 to 39 cms (14 to 16 inches) whilst they have a wing span of 95 to 100 cms (37 to 39 inches) with females approximately 15% heavier than males. 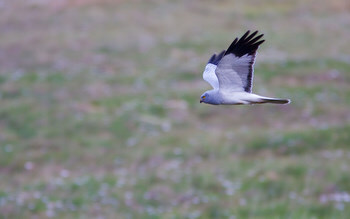 Like the Hen Harriers they nest on the ground in similar habitats and share the same type of prey although Short eared Owls have distinct preference to Field Voles and other rodents. 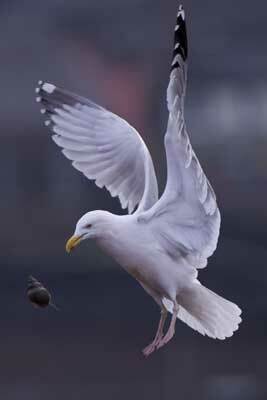 They lay between 4 to 8 eggs dependent on vole population with incubation taking between 24 to 28 days. The young leave the nest at about 2 weeks old with young dispersing in July, in exceptional vole years some birds will have a second brood.